Did I ever tell you guys that I used to work in the Goodwill circuit? For years, actually, and in three different cities. I started out as a lead associate for one in St. Louis the summer before college; then moved up to a low-level manager at the one in my college town and worked there for almost two years while I went to school; then when I moved to California and couldn't find a publishing job, I was an assistant manager at one for 18 months. It seems like another lifetime when I think back on it, but I did learn a lot about resale, which serves me well now. I bring this up as a very shallow tie-in to today's post, which is about that Sheffield pattern (Golden Meadow) that I've started piecing together. I found my first piece, an oval platter, after I had quit working at the Goodwill in Santa Monica, which meant I was finally allowed to shop there (in Cali, you're not allowed to shop at the store in which you work, but you can shop at any other one). I instantly fell in love with the delicate pattern and loved how it wasn't one that covered the piece in a even, symmetrical way. So for the past six years since then, I've held onto the platter as one of my favorites, and didn't even think to look for its mates until I scooped up some berry bowls and a couple saucers at a thrift store here in St. Louis. And that was honestly the first time I'd seen the pattern in a thrift store since my initial spot. Fast forward almost 8 months from the berry bowls, and I scored those dinner and dessert/salad plates this past weekend in Omaha. In between then, the hubs and I found a fairly complete set at a little dive thrift somewhere in Texas or Oklahoma, but they wanted $200 for it and wouldn't break up the set, so we passed. All this to say...I don't find this pattern often on my outings, which might be why I had to dig deep on the Internet to find out anything about it. My answers, like most, came from a forum that I stumbled across, where someone who had educated him or herself immensely on dishware gave some great bits of knowledge that helped me hone my search. He/She said she pulled her information from Lehner's Encyclopedia of U.S. Marks (of which I plan on buying a copy), and it said that Sheffield was used in the 1960s as a trade name of J. and H. International on products made by several companies, including Homer Laughlin. 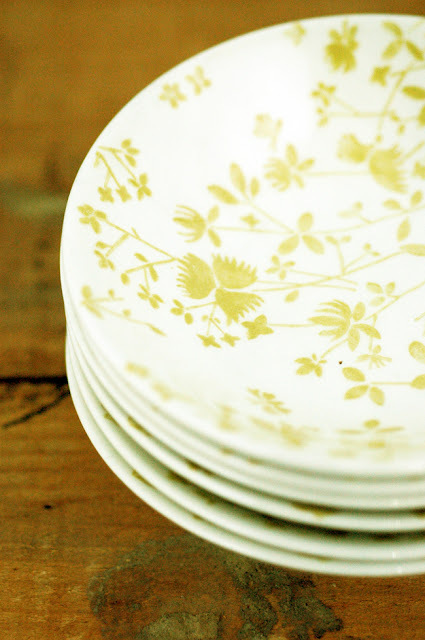 He/She also goes on to say that the Golden Meadow pattern was made by HL and also sometimes by Royal China. Based on what I've seen for sale online, it seems the Ironstone part of the stamp is what ties it to Homer Laughlin, but that could be an incorrect assumption. I confirmed the first part of the previous paragraph's information here, although they say 1970s instead of 1960s, and they give some examples of other patterns under the Sheffield name. I see the Serenade pattern all the time, and actually used to have some of the Lucerne plates as well, but I think I left them with my girls back in Cali. Another thing to note is that, of all my pieces, only the platter and the dinner plates have a stamp on them. The others (berries bowls, dessert plates, saucers) aren't marked at all, which I think is curious. So if you go looking for Sheffield, it's best to know the patterns in case you don't come across any of the bigger stamped pieces. And that, my dears, exhausts what I learned this week as I researched Golden Meadow. Any of you have little tidbits to add? Would love to know as much as I can! I just inherited a full set minus some of the accesorie pieces that belonged to my Grandmother. My mom used it for a short while and I told her if she ever tired of it I wanted it. I am so in love with its sweet vintage pattern. Thanks for the education. Do you know if they are microwave safe? my hubby found a 12 place setting plus the platter and 4 serving bowls at a yard sale in a small town close to where I live in Missouri. I was sooo excited when he brought them home!! Wow! He has a great eye! That's a wonderful find! Five for $2? That's an awesome find!! Good luck (and have fun!) piecing it together! Totally worth it; I don't think I'll ever get rid of my set! My grandmother had given me a full set of 8, to include a serving plate, serving bowl, a sugar and lid bowl, creamer cup, little cups and saucers, side plates, dessert plates and little dessert bowls, dinner plates. I used the set in college in 1993-1995 and then packed it up and forgot about it. A month ago I separated from my husband of 17 years and moved into a little country cottage. I instantly thought of my grandmother's dishes and unpacked them from so long ago. They are absolutely beautiful and I'm so grateful that my young self did not just toss them out. Are these dishes made thin and dainty or are they heavy and more durable?? 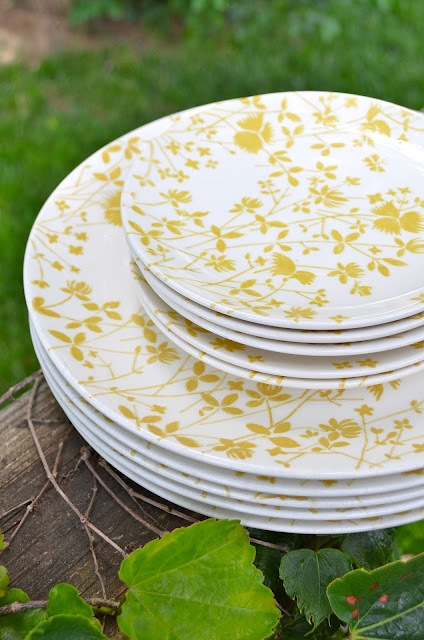 I just purchased today the Golden Meadow pattern from a thrift store. There are 3 platters, 9 dinner plates, 8 cup saucers, 5 cups, 3 large bowls, 2 medium bowls, 1 gravy bowl and rest, 1 sugar dish with lid, 1 creamer, 1 set of S&P shakers, 1 butter dish, & 1 coffee pot with lid for $20.00. I didn't know I had such a find! I have had some odd pieces of this pattern from a garage sale a few years ago just because I liked the pattern. Well let me tell you I scored big today, I bought a big set even with the matching gold glasses for $17.00. I got 11 dinner plates, 2 platters, 5 serving bowels, the gravy bowl, sugar bowl, creamer, salt and Pepper l1 saucers and 8 cups, butter dish and a small platter of sorts. Now I need to find a place in the kitchen cabinet for all.